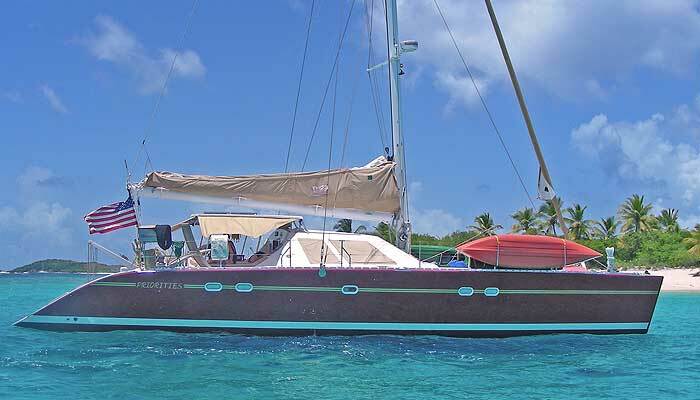 Luxury Sailing Catamaran RAVEN (ex Priorities), is a Lagoon 57 privately crewed charter yacht based in the British Virgin Islands of the Caribbean. 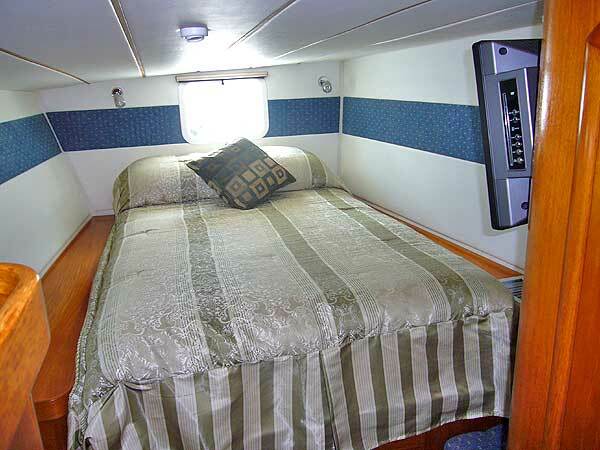 Available for luxury charters for up to eight guests, she is the perfect charter vessel for a relaxing and fun filled vacation at an affordable price. 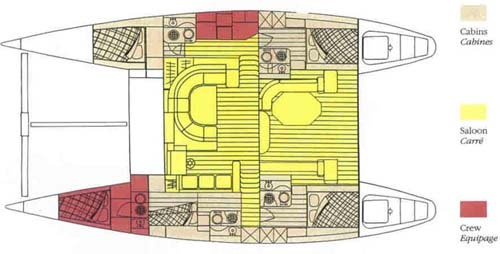 With four comfortable and air-conditioned cabins, including three doubles and one twin with upper and lower bunks, RAVEN is the perfect family yacht and also suits groups of friends. 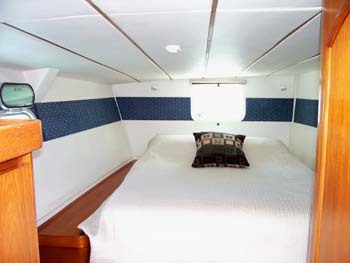 All of the cabins have TV and DVD players and there are also Sony Play Stations on board should the kids have enough energy after a day of fun to use them. Her comfortable saloon is a great place to take an afternoon nap or enjoy a movie together in the evening. 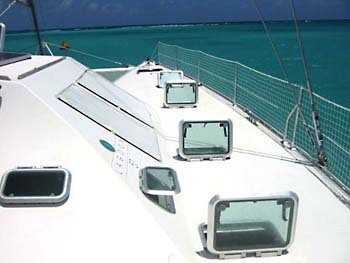 Her cockpit seats eight for alfresco dining while enjoying the fabulous views of the Caribbean Sea. 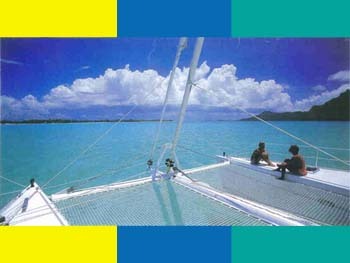 The trampolines on the bow are perfect for working on your tan or stargazing, cocktail in hand of an evening. 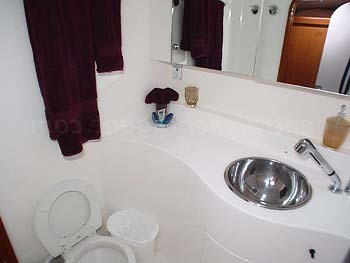 Her all inclusive price means that once you have booked your vacation you will have to think of little else. 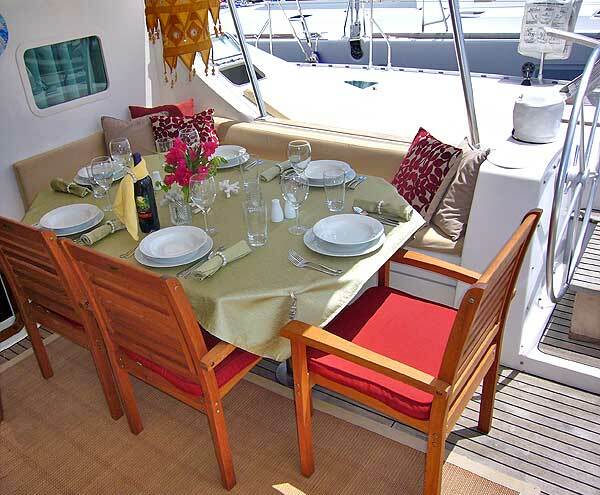 The professional crew on board will delight you with a gourmet menu (they have a background in fine dining restaurants), superb cocktails and firsthand knowledge of the cruising area. 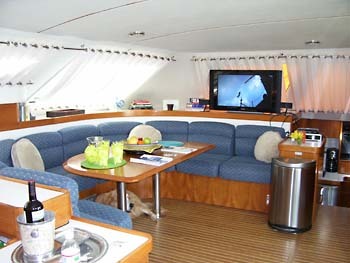 You can pack as little or as much as you like into your charter, the itinerary will be personalized to meet your needs. 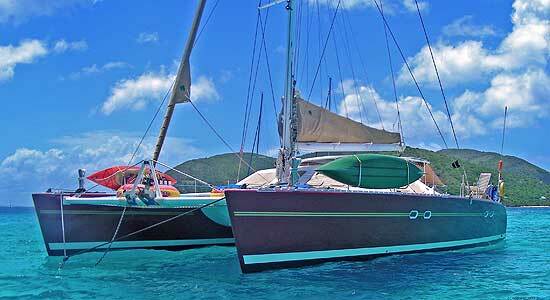 Each meal served aboard RAVEN will be tailored to your tastes, from breakfast to scrumptious multi-course dinners. 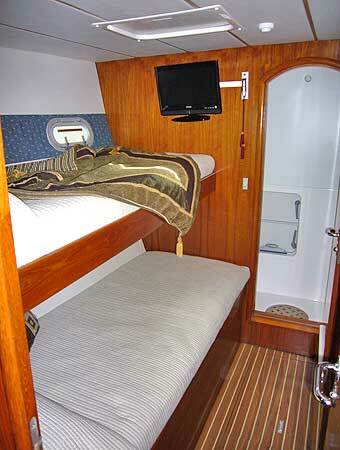 RAVEN features four staterooms each with en suite head and shower. 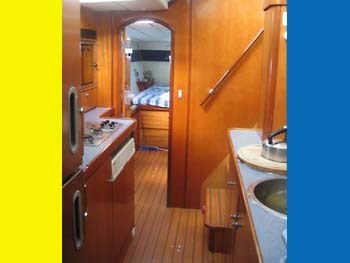 3 suites include queen beds, while 1 suite features 2 twin bunks to accommodate everyone in your group. RAVEN measures 57ft. 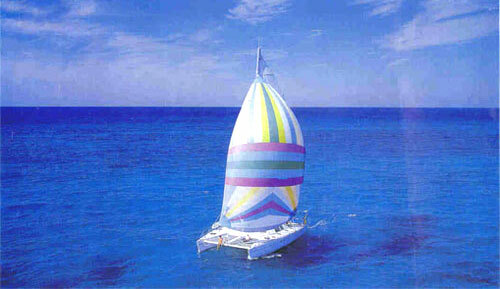 with a 30ft. 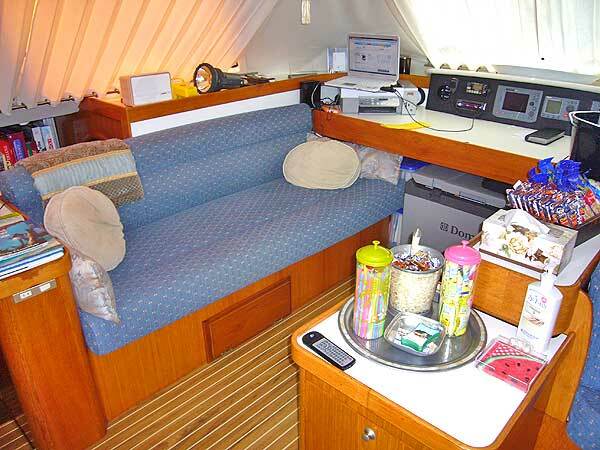 beam offering plenty of room to relax and have fun both above and below the deck. 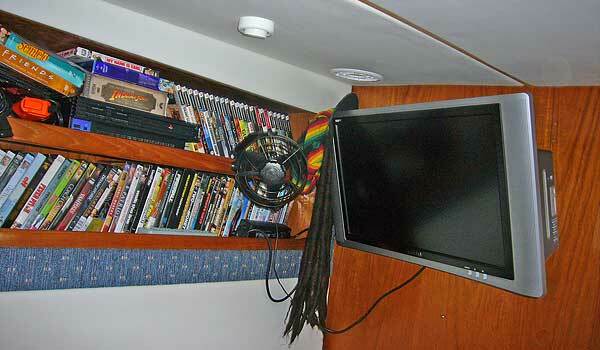 All cabins have combination TV/DVD/CD player. 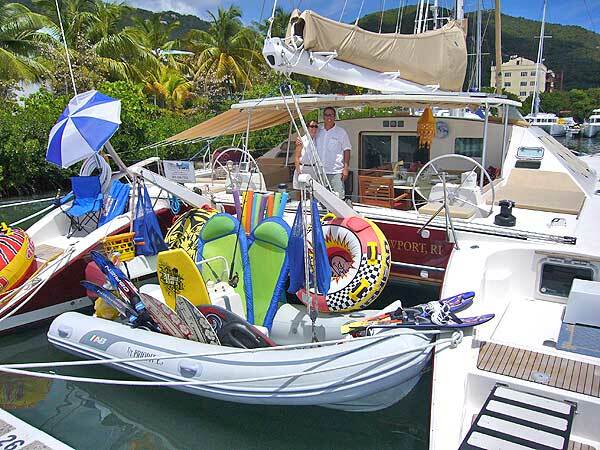 15' Dinghy w/ 60 HP, Tube - Water Skis, Snorkel Equipment, Fishing Gear, Hammock, 2 Double Kayaks 1 Single Kayak, IPOD docking Station, Internet – Email, Indoor outdoor Stereo Sound system, Sony Playstation 2 with Library, 32" High Def Plasma TV, High Def Plasma TV/DVD/CD in all staterooms Icemaker – Watermaker, Washer Dryer, Fully Air Conditioned w independent controls.